Sand dunes along the way. The entire west coast of Michigan is this way so far. We bravely left Leland this morning and headed for Manistee. The NOAA predicted wave heights grew from 2 – 3 feet last night to 2 – 4 feet this morning. The wind was down from 30 last night to 15 mph by our measurement. Weather underground said it was 16 mph last night and 7 this morning. I’ve still got some learning to do concerning how to use all this weather reporting information. At least the waves weren’t crashing over the breakwater like yesterday. We got the lines and fenders arranged, used the bathroom and both got our seats topside before we left the marina breakwater, because once we were in that stuff nobody was walking anywhere. We’d already moved things that might fall off a shelf or table to the floor. One cupboard door did open in the kitchen and some dishes were on the floor, but only two broke. Waves today were the roughest we’ve seen this season and equal to Albemarle Sound last year. They were head on or nearly so, so there was less roll than there might have been, but a lot of the bow rising on one wave and then crashing right into the second. 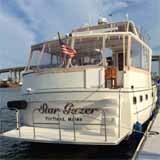 We passed several inlets to harbors. Most are 20 – 30 miles apart. Fortunately things calmed a little (not a lot) later and we could use the bathroom and get some fruit to eat. Next time we’ll prepare some sandwiches in advance for lunch. Forgot that today. 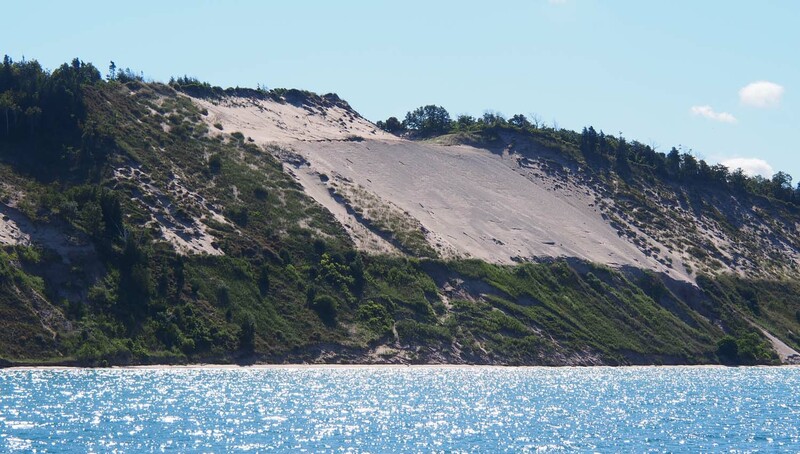 We did pass by Sleeping Bear dunes and saw them from the lake side. They’re not the only dunes. Along the way we saw more hills coming up to the water’s edge today, and all of them were sand. After 60 miles we arrived at Manistee. In size it’s between Leland and Traverse Bay. It has a nice old downtown that is very pleasant, but would be nicer if there were fewer vacant buildings. Sue stopped to watch the TV weather in one downtown store. They said “Winter is coming early, if you want to go boating or do something outdoors tomorrow (Saturday) will be your last chance until maybe Thursday next week.” Sure enough, when I checked my weather apps this evening tomorrow looks on the edge of doable while the next number of days are out of the question. So it looks like no resting here, we’ll be off early in the morning. We’re shooting for Muskegon, 80 miles to the south. It’s a long trip, but we may be stuck there awhile, and that’s the first place since Traverse City where we can rent a car. If we can’t boat, we’ll drive across Michigan to Marty and Cheryl’s. We want to tour some car assembly plants and see the Henry Ford museum.